There are lot of e-book reader apps such as Amazon Kindle app, Aldiko, Moon+ Reader are available for Android on the Play Store and you might ask , we already got so much of book readers in the android world, why another one? what could make differentiate the Fabrik Reader from the other one. It highlights itself separately in the way of giving simple reading experience. Persons who are having the habit of enjoy reading on their smartphone will definitely satisfy with this app. It was developed by XDA Forum Member eirikrwu. 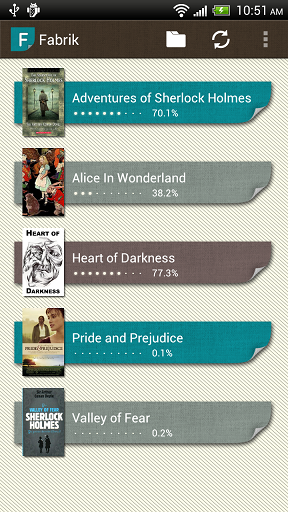 This app lets you read e-books stored in your Dropbox account directly on your Android device. Fabrik Reader has a user interface optimized for phones and tablets alike. On tablets, it lets you read in landscape mode using a two-pane interface. This application also supports txt, epub and mobi formats. Complete synchronization of the entire reading experience with your Dropbox. Tablet optimized two column landscape reading model. Share your reading progress (with a beautiful book cover). A beautiful interface that will make your reading experience really premium, and easy on your eye. Customize font, text size, line spacing, screen brightness, night model, etc. Support txt, epub, mobi format. Find covers for your book automatically which make your book looks even better. Fabrik Reader may not be the most feature rich eBook reader for Android but it is simple and gives a very good reading experience on the go. If you are using some of the “heavy in size” eBook readers and easily gets lost while using the application, you should definitely download Fabrik Reader and give it a try. It’s free any way so why not give it a shot?